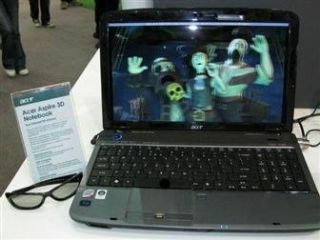 Acer is to release a 3D notebook in Q3 this year, which will house both support for 3D movies and the ability to convert normal 2D films into 3D. There's little information on the notebook, except that it will be a 15.6-inch model and will come with Windows 7 – due for release this October. Although you will need to use stereoscopic glasses to use the notebook in question, Acer has teased that an autostereoscopic (non-glasses) version is being mooted, although the technology to do this effectively isn't quite there yet. 3D laptops are nothing new, with Sharp debuting its own 3D laptop way back in 2003 – the Mebius PC-RD3D. With the cinema screens of 2009 currently awash with 3D-based movies, there's no doubt that Acer will be the first of many to announce the arrival of a 3D-Ready laptop in the coming months.